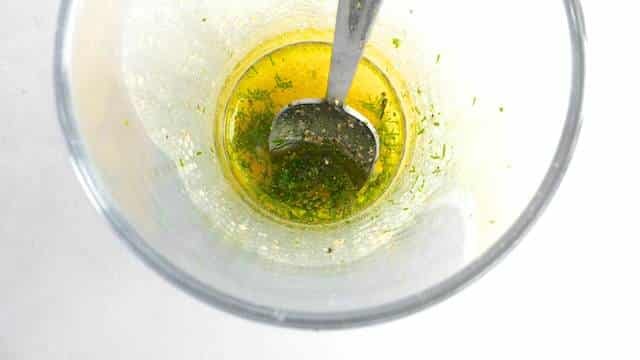 Poireaux Vinaigrette Recipe | Simple. Tasty. Good. 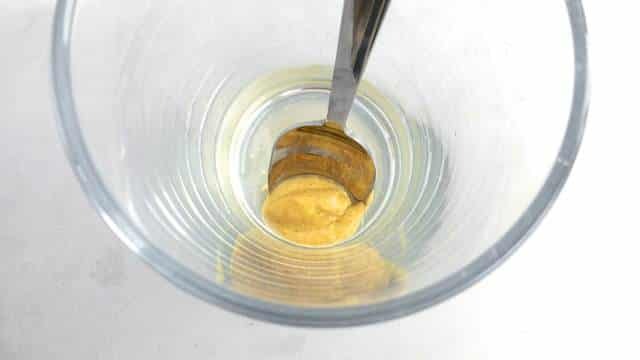 Here’s another example of classic French cuisine: poireaux vinaigrette. Let’s dissect that one first off. Vinaigrette, I have an idea you might all be familiar with this cooking term. Vinegar, mustard, olive oil and fresh herbs dressing. And poireaux? Well that is French for leeks. So there you go. Plain and simple. Leeks in vinaigrette. Nothing more to it! I heard of this dish for the first time in a cool Paris bistro restaurant, Le Bouillon Chartier. Vinaigrette leeks are served as a starter to boost your appetite. Look at it. I mean it’s not rocket science. To give you another popular French starter (also on the menu at Le Bouillon Chartier): oeuf dur mayonnaise. Oeuf dur is French for hard-boiled egg. Mayonnaise, you know. So here’s what you get: a hard-boiled egg dressed in mayo. It can also mean deviled eggs. Depends on the chef. So here you go: leeks in vinaigrette. Great as a fresh starter or a light lunch. You can easily steam the leeks a day in advance and assemble the vinaigrette in just a couple of minutes right before serving. Quick and easy. Another example of classic French cuisine. Super soft steamed leeks drizzled with a tangy vinaigrette! Trim and clean the leeks. Rinse them well under cold running tap water. We are going to steam the leeks. I used a pasta pan, placed the leeks on the bottom of the pasta basket and added about and inch (2,5 cm) of water to the pan. 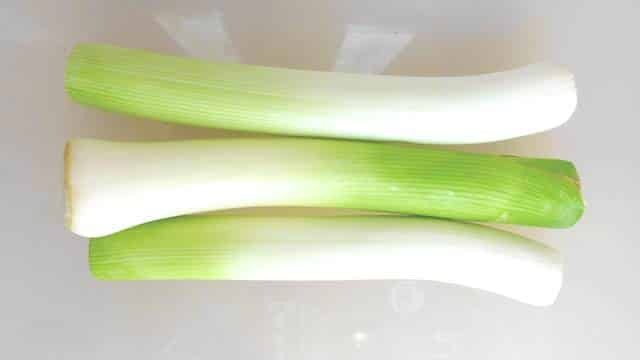 Bring the water to a good boil over medium-high heat and steam the leeks for about 30 minutes until extremely soft. You can also prepare them in a steam basket or steam oven. 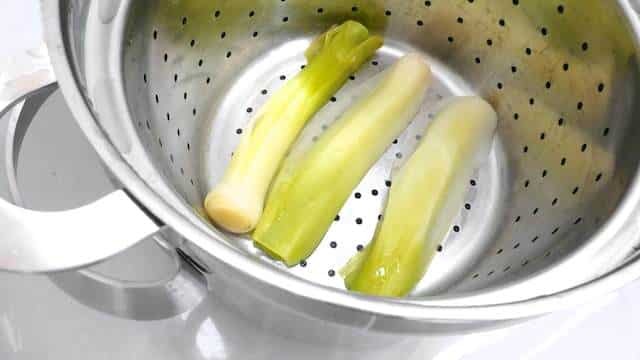 If you are not in the possibility to steam anything in your kitchen, you can always boil the leeks. 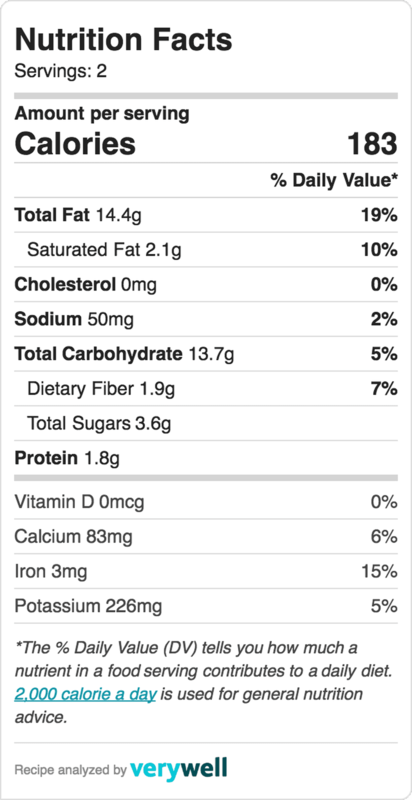 That however will reduce the flavor a little though. That’s why I prefer to steam them for this recipe. Remove the leeks and let them chill and cool down at room temperature for a couple of minutes. In the meantime we are going to make a simple vinaigrette. 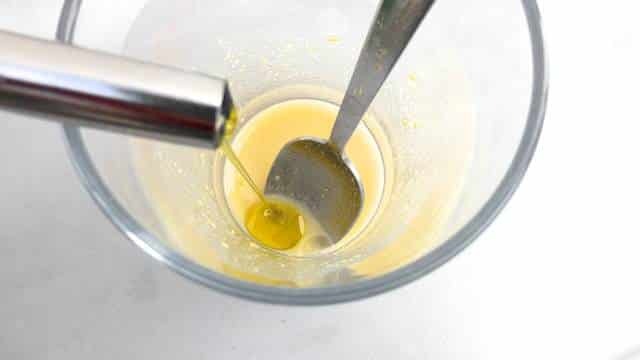 Pour the white wine vinegar in a small cup and add the strong mustard. Stir a little. Then add the olive oil little by little. Then add the freshly chopped dill or chives. Season with a pinch of salt and pepper. Stir and check the seasoning. Add extra vinegar, mustard or pepper to taste if necessary. 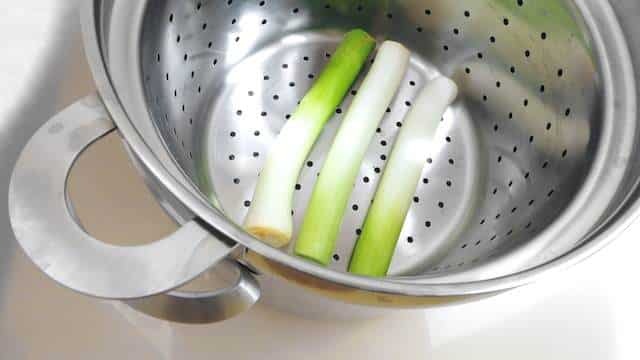 Slice the cooled leeks lengthwise in half and place them on a clean serving dish. Drizzle with the vinaigrette. Serve at room temperature.